Hi, I'm Noelle, and I'm the latest addition to GCCSR. They call me their Christmas miracle because I landed at BARC after being picked up as a stray, am in need of some pretty extensive medical care, and was lucky enough to find an available foster home here in the program. I'm blind, heavy heartworm positive, malnourished, and in need of some TLC, but my new doctor tells me I'll be a new girl in a few months. 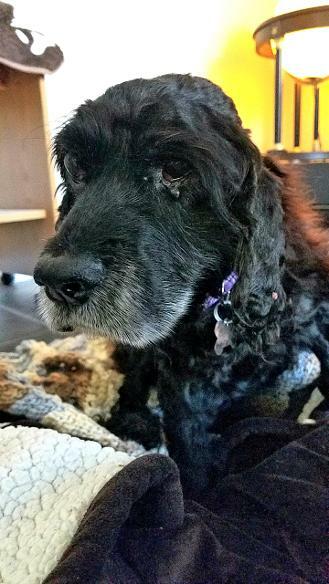 My foster mom is already smitten with me, said I'm learning the lay of the land quickly at my new digs, am very sweet and affectionate, and I get along great with her other dogs. I'm eating well and gaining strength so I can get ready for my surgery. Doc said he'll spay me, repair an inguinal hernia, and clean my teeth if there's time under anesthesia. In the meantime, I'm enjoying soft, warm beds and more attention than I've had in a REALLY long time. I've heard Coffee Nation is awesome, so let me thank you guys for taking a chance on me. You won't regret it!